Admittedly, salmon is one of our all-time favorites, whether it’s grilled, pan-fried, roasted, poached, baked, or made into patties. 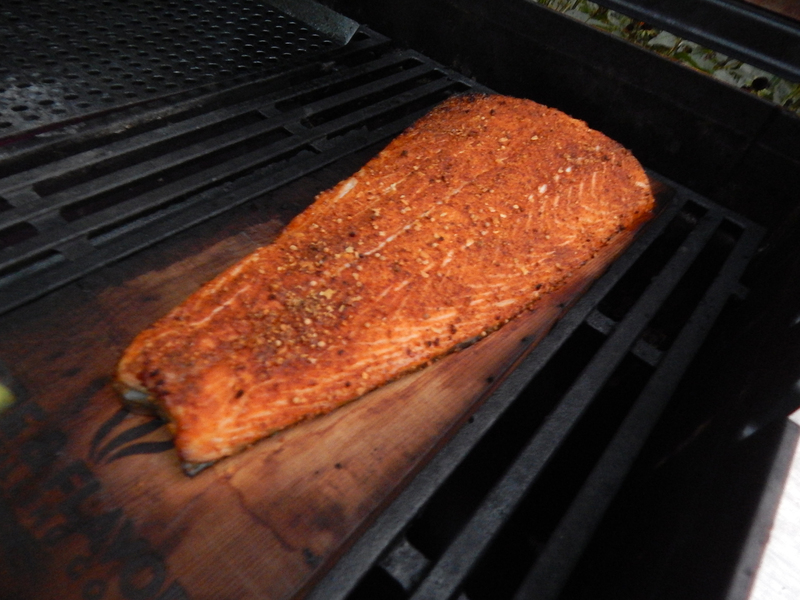 And if you have a penchant for salmon like us, try the grilled cedar plank method. It’s super-easy, and is a plus for a healthy diet. You can buy cedar planks in many grocery stores, at home centers such as Lowes, or online. Just make sure you soak it submerged in water for a minimum of one hour. In our latest attempt, we filled the kitchen sink with several inches of clean water, and put a heavy object on top of the plank to keep it submerged in the water instead of just floating on top. 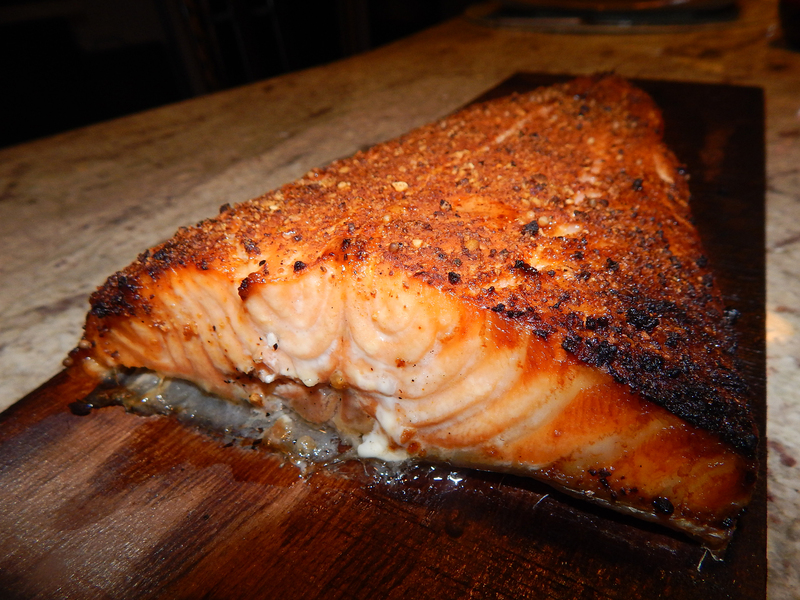 Our salmon filet was 1 1/2 pounds, plenty for three people (possibly four depending on what else you are serving.) The fish was patted dry and then sprinkled with a store-bought McCormicks rub mix of Sweet Citrus and Spice, and it got “happy” while the wood soaked in the sink. While chef guru Bobby Flay says to remove the skin, we did not; however we probably will try that advice next time to see if it makes any difference. Set grill for indirect grilling and heat to medium-high. When ready to cook, place the plank on the hot grate and leave it until there is a smell of smoke, about 3 to 4 minutes. Turn the plank over and place the fish on top. 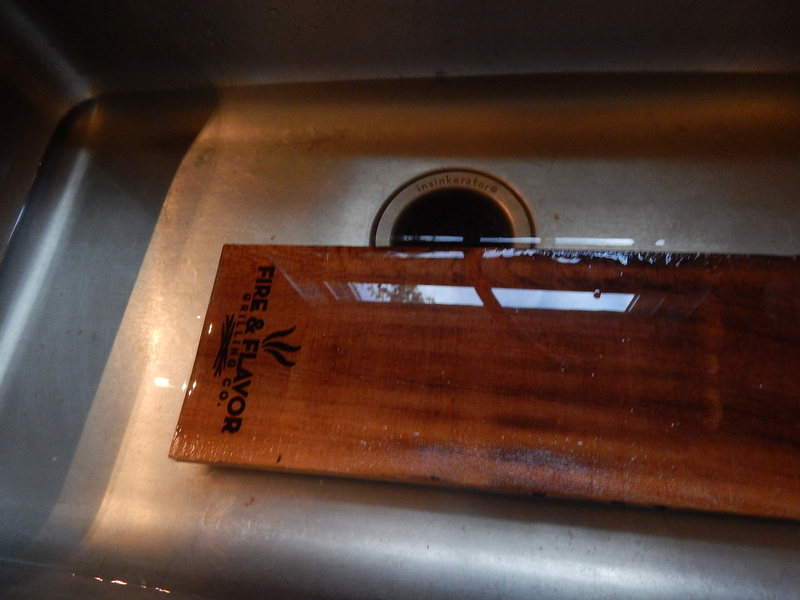 Place the cedar plank in the center of the hot grate, away from the heat. Cover the grill and cook until cooked through, around 30 minutes, turning the plank 180 degrees after 15 minutes. The internal temperature should read 135 degrees F. Check the plank occasionally. If the edges start to catch fire, mist with water, or move the plank to a cooler part of the grill. There should be a nice char to both the plank and the fish exterior. 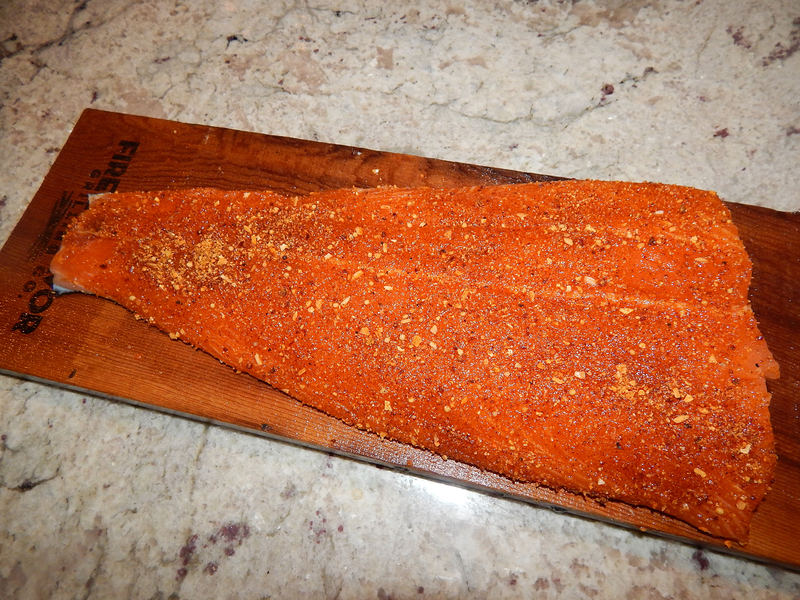 We served the salmon directly from the plank, but if you desire a more formal approach, certainly transfer to a platter. Serve with lemon wedges.